This year's Welcome Event for freshmen students was on Monday, April 4, 2017. We hope students enjoyed their chance to meet some new friends and chat with teachers. We also heard about study abroad opportunities and tips on how to get the most out of the English Reader Marathon. Good luck this year! And check out the photo album! This year's Welcome Freshmen event was held on April 2, 2016. Students in the English Dept. 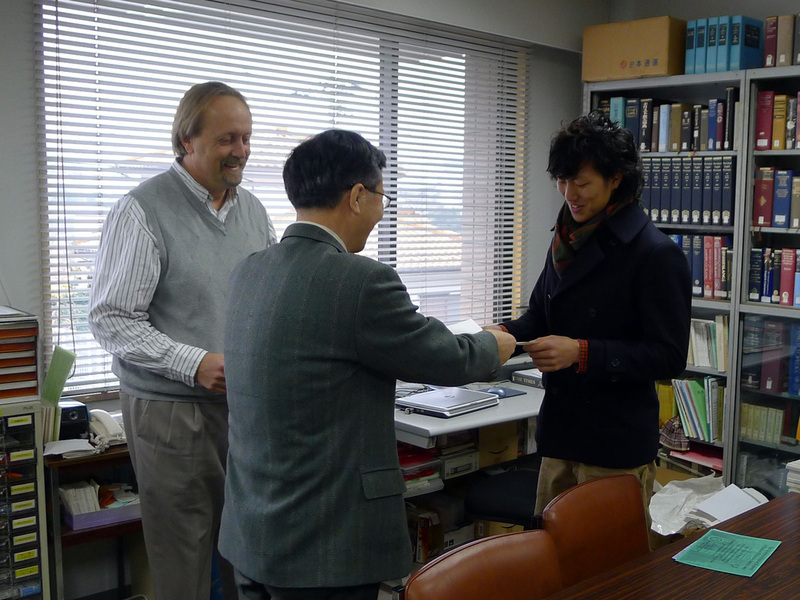 at Tsurumi University had a chance to meet the full-time teachers as well as chat with other new students. Like last year, some of the 'sempai' students gave short presentations about study abroad and about the extensive reading program at Tsurumi. Hopefully, this will help new students prepare for the new school year. We welcome all our new students and thank the upperclassmen for their cooperation! See the photo album or click on the photo at right for more pix. English Department students participating in Cool Tsurumi! 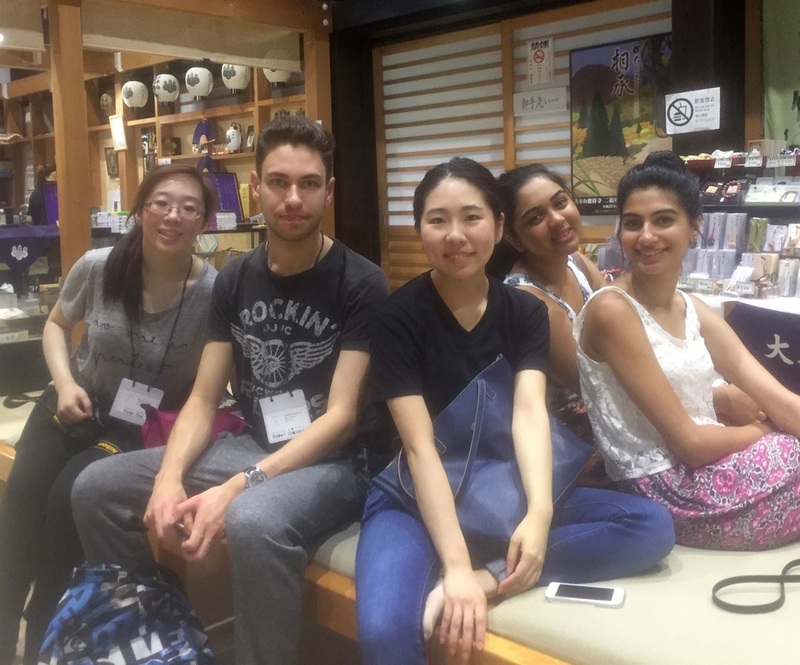 In July 2015, students from the Institute of Dentistry at the University of London, Queen Mary, came to Tsurumi University for clinical observations and to participate in the Cool Japan; Tsurumi Taste program. Volunteers from the English Department joined in many of the activities, and students had a chance to use their English with students from London who spoke no Japanese. Among the activities were Zazen practice at Shoji-ji, our affiliated Buddhist temple, and a trip to Kamakura for sightseeing, craft making and shopping. 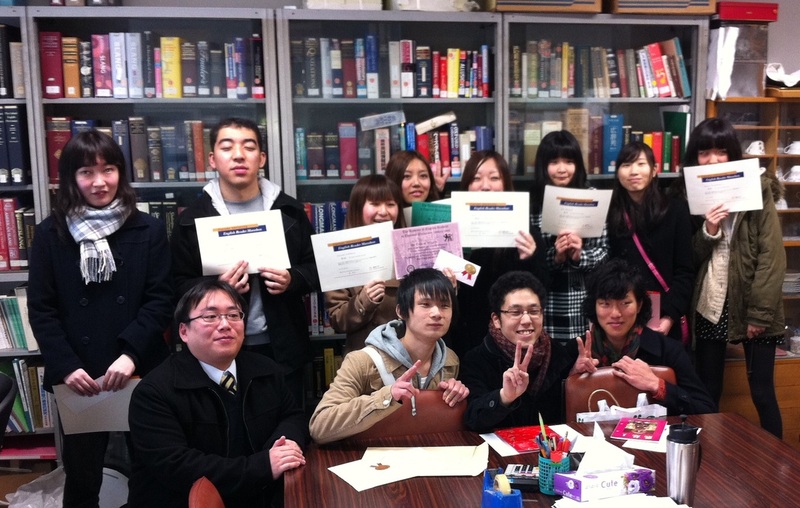 Check here for photos London students and Tsurumi University students. On April 4, 2015, the English Dept. at Tsurumi University welcomed the new freshmen. Students had a chance to meet the full-time teachers as well as chat with other new students. This year, some of the 'sempai' students gave short presentations about classes they are taking and about the extensive reading program at Tsurumi. Hopefully, this will help new students prepare for the new school year. We welcome all our new students and thank the upperclassmen for their cooperation! See the photo album or click on the photo at right for more pix. Congratulations to all of our Tsurumi University graduates and their families. We wish you all a great future! For photos, check out the photo album of the graduation ceremony. To see your own individual graduation photo, you should contact Watanabe-sensei to get the link to the private online photo album. English Square 2014 offered up quiz games, live guitar performances, and a sing-along featuring visiting professor Mark Cooper from the University of New England in Armidale, Australia. Click here or on the photo at left for more pix from English Square. Read posts from students on the 2014 Australia Study Tour here! Photos from students at our long-term study abroad programs in Regina, Canada and Armidale, Australia, can be found here! On April 3,, 2014, the Tsurumi University English Dept. welcomed the new freshman students at our annual Welcome Freshmen event. Students spoke to teachers and each other in English and hopefully made some new friends. We are looking forward to meeting all the students again on April 9! Click the photo at left or here for more pics. 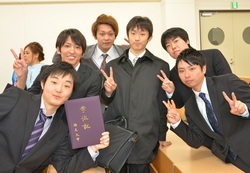 Congratulations to all Tsurumi University graduates and their families! Click on the photo at left or here for more images. You can also see photos at Kevin's website. In Sept. 2013, Tsurumi University lecturer Kevin Miller visited the long-term study abroad students at the University of Regina, in Saskatchewan, Canada. 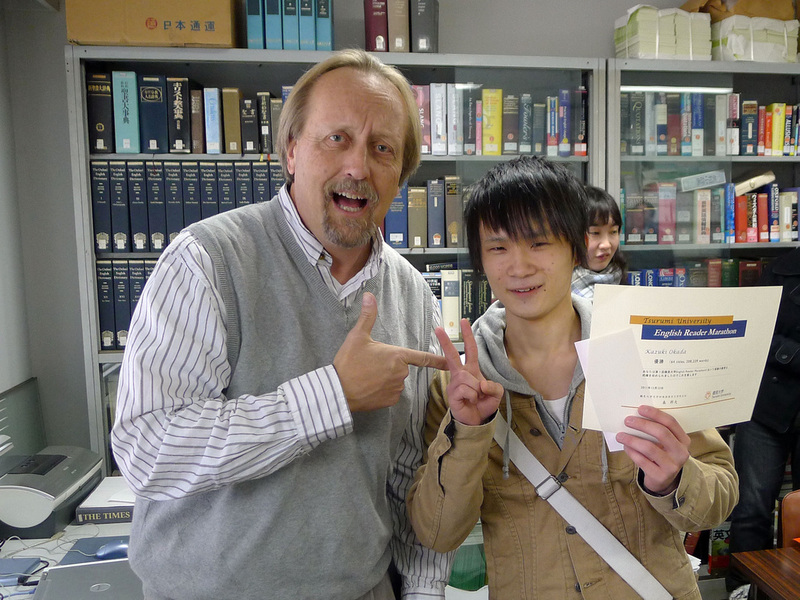 Currently, there are four Tsurumi students studying English in the ESL program there. They have many chances to speak English, both in their classes and at home. Students have a homestay experience, and they chat with people from all over the world every day. Regina is a safe community and a great place to study English. The staff at Regina take good care of the Tsurumi students. 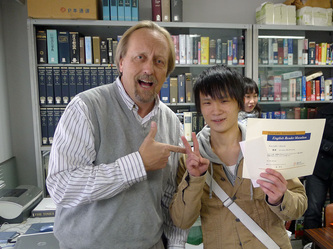 Our Tsurumi students will finish their study abroad experience in December of 2013, after which they will return to Kanagawa. Gambatte Tsurumi study abroad students! Photos! 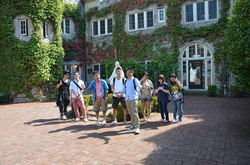 From late August to early September of 2013, fifteen students from Tsurumi University visited San Rafael, a suburb of San Francisco on a 3-week study tour. Highlights of the tour were trips to San Francisco, an MLB baseball game (Oakland Athletics), and a trip to Alcatraz. There were also classes, afternoon shopping excursions, and some dinner parties. See photos here or click the photo at left. Once again, the Tsurumi University English Dept. welcomed the new freshman students at our annual Welcome Freshmen event. Students had a chance to speak to each other and to the English Dept. teachers. 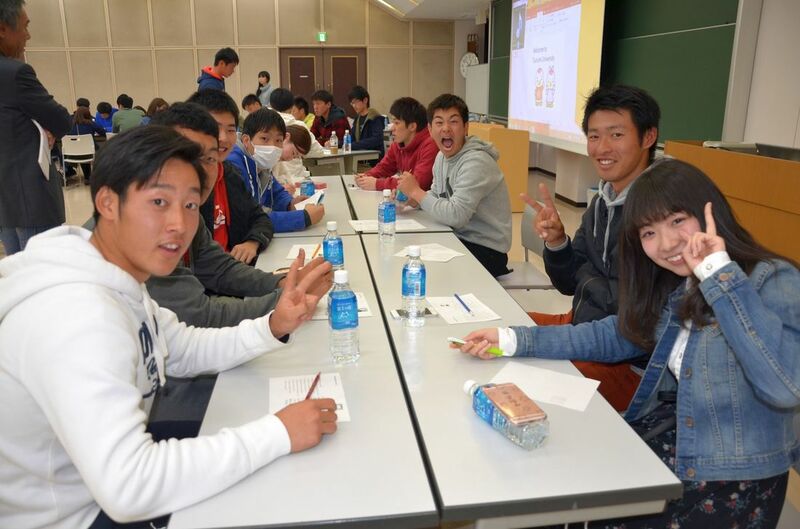 We hope students had a good time and are looking forward to studying English together from April 8! Gambatte! Click the photo at left or here for more pics! Thanks to our student volunteers who helped at the event. English Square is an English event held every year at Tsurumi University during the annual fall festival (Shiunsai). This year's event was a joint production by the English Department and the ESS Club. There were four main activities: Across the Universe in Music Quiz Game, Musical Chairs, a sing-along, and a funny student film made by Martin Connolly and the students in his Communication Skills class. The event was done twice, once in the morning and once in the afternoon. Click here or on the photo at left for photo albums of the event. A welcome party was held on Oct. 3 for new Korean students, Shin Jongun and Yang Sangyu. Click here or the photo at left to see more photos from the event. The Australia Tour 2012 photo album is now available. On June 16, 2012, the International Manga Symposium was held at Tsurumi University, featuring special international guest presenters, Sylvain Rheault, Gan Sheuo Hui, Ronald Stewart, and C.J. (Shigeru) Suzuki. Also presenting were Keiko Miyazaki (Tsurumi University), Kazushi Oya (Tsurumi University), and Kotaro Nakagaki (Daito Bunka University). For more photos and scans of the symposium pamphlet, click on the photo at left or view the photo album. See photos of the Welcome Freshmen Event 2012! 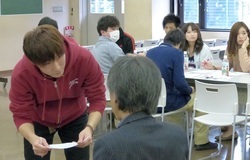 On April 3, 2012, the Tsurumi University English Dept. welcomed the new freshman students. We look forward to having a great 4 years together! At the freshman event, we had a quick lunch, followed by two conversation activities. The first activity was a chance for all students to meet someone from another class. The second activity was a chance to meet all the English Dept. teachers. We hope students had a good time and are looking forward to studying English together from April 9! Gambatte! Click the photo at left or here for more pics! Thanks to our student volunteers who helped at the event. Thanks also for taking these great photos! 2011 English Reader Marathon contest winners! Click on photos for larger view.